2. Schematic diagram of equipment. The switch has two input voltage supply specifications: 5V and 5V/12V. No matter which specification is selected, the functions remain the same. When the module is switched to self-locking mode, users can turn on/off the connected appliance immediately.. There are two wiring way. There are 3 LEDs, the LED beside self-lock/inching mode button indicates the working mode(on: self-locking mode, off: inching mode). And the one below the relay indicates relay on or off status(on: turn on the connected device, off: turn off the connected device). 1.Power up the device with 5V DC or 12V DC. 2. Press the above button for 7 seconds until the red LED fast blinks. If you are using the new version, please select TOUCH icon. Click next. 5. 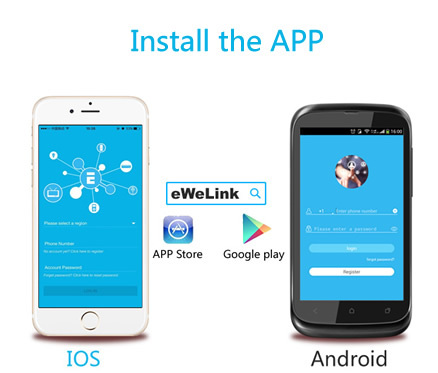 Next, eWelink will search the device and add it to your account，it takes 1-3 minutes. When this complete, you can give your device a name. Maybe the device is “Offline” on eWeLink, for the device needs 1 minute to connect with your router and server. When the green LED on, the device is “Online”, if eWeLink shows still “Offline”, please close eWeLink and re-open. If below answers can’t solve your problem, please submit a feedback on eWeLink. 1.2. Green led slowly blinks one time and repeats, which mean the device has connected to router and server but failed to be added to device list. Then power on the device again, if it still not working, just add the device again. 2. Why the APP can’t find the device in paring status?